Masterpieces is our high-end product line. 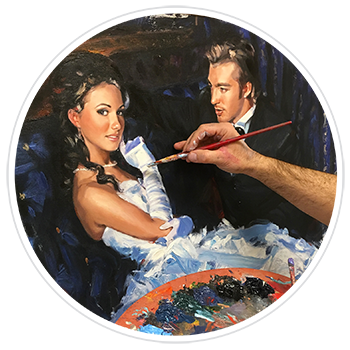 We recreate your photo into a hand painted, oil-on-canvas original. Amazing textured brushwork using Winsor & Newton oil paints. Each painting is hand signed by the artist and comes with a certificate of authenticity. All paintings are created and finished in North America by academy trained artists. All frames are from Larson-Juhl’s solid wood line. Artworks is our value product line. We recreate your photo into original artwork. 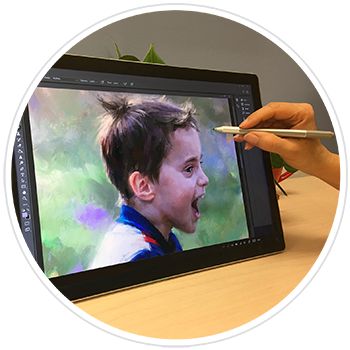 Each work is hand painted, inch by inch, with customized stylist brushes on a special tablet. Each finished work has the look of an oil painting. Each painting is hand signed by the artist and comes with a certificate of authenticity. All paintings are created and finished in North America by academy trained artists.